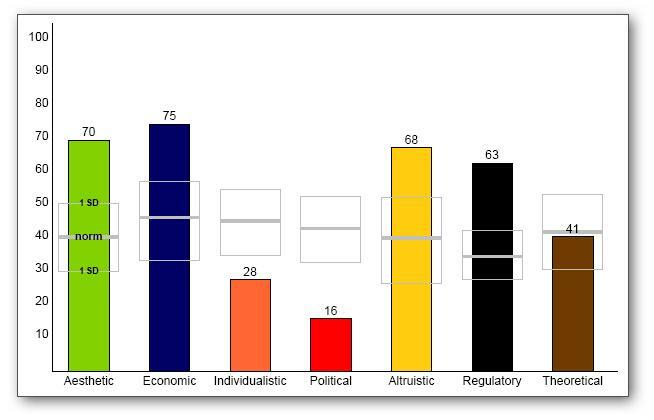 The Values Index ™ is a personal beliefs assessment instrument developed by Innermetrix, Inc. that helps people to understand and appreciate the unique mix of personal values which defines their attitudes and drives their behaviors. It is designed to help individuals identify their personal motivators in order to recognize why they do what they do, and guide them to achieve improved performance and satisfaction through better alignment between what they passionately believe and their daily interactions. The Values Index combines and builds on the work of Dr. Eduard Spranger and Dr. Gordon Allport into a single profile that delivers the world’s most comprehensive understanding of a person’s value structure and his or her motivational style. Values can play a major role in influencing behavior, but they often remain hidden to others because they are not readily observable. Understanding what really drives a person and satisfying those motivators is a crucial part of personal success. Research conducted by Innermetrix indicates that most successful people share the attribute of self-awareness. They are acutely aware of who they are and what drives them, and as a result, they are able to recognize those situations in which their intrinsic values can lead to success. They also understand their limitations. Because they know what does not inspire or motivate them, they can avoid those circumstances where they recognize that their inherent values will not be conducive to success. People who understand their natural motivators are far more likely to pursue the right opportunities, for the right reasons, and get the results the desire. To reach optimal performance, you must understand WHAT natural talents you possess, WHY you are motivated to use them, and HOW you prefer to use them. The Values Index reviews the WHY portion of the What, Why, and How triad. By understanding WHY you prefer to behave as you do, you are able to better align your environment, select the work that ensures more meaning and success, and experience less stress in doing so. The Values Index is useful for understanding how to motivate yourself and others by understanding the reasons that drive individuals toward success. This information is especially helpful in employee development and in coaching scenarios for increasing employee engagement. Setting a goal that provides monetary rewards to someone with a high altruistic dimension, for example, will not likely deliver the anticipated motivation or inspire superior performance. Similarly, incentivizing a high economic with promises of improving society (assuming there is no obvious economic return) would not be an effective way to motivate that person.